Gables Farm in Martham, near Great Yarmouth, Norfolk sleeps 10 people. Gables Farm near Great Yarmouth is set within easy reach of the Norfolk coastline and has plenty of attractions nearby to keep all ages entertained. This period detached farmhouse is tastefully presented to provide spacious holiday accommodation for larger families and friends. The enclosed courtyard boasts its own hot tub for 4-6 people. 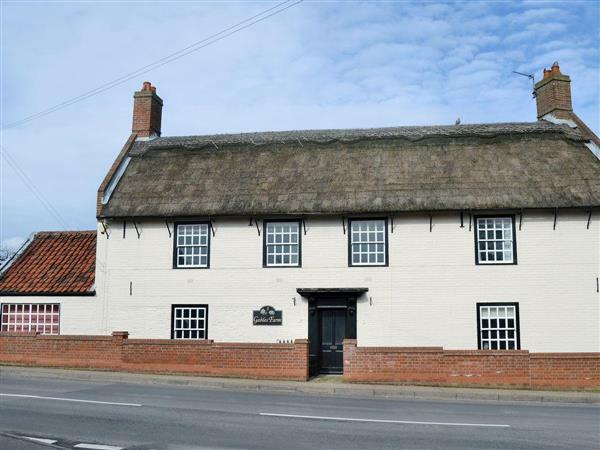 This property is tucked away in the pretty village of Martham, with the village green and its duck pond nearby, as well as local shops and pubs just a short walk away. Winterton-on-Sea is just 3½ miles away and has an excellent sandy beach, with some areas designated dog friendly, and is perfect for a bracing walk whatever the time of year. Just a 30-minute drive away is the famous Norfolk Broads. Villages of Potter Heigham, Horning and Wroxham boast daily river trips, hourly boat hire, shops, riverside pubs, cafés and restaurants. The traditional seaside town of Great Yarmouth is 10 miles away, with its amusements, pleasure beach fun fair that offers thrill rides galore, a wide sandy beach, Waxworks, pitch and putt golfing, leisure centre with an indoor fun pool and town centre with shops, supermarkets, cafés and restaurants. Pleasurewood Hills, 19 miles, is a thrill seeking theme park that will provide fun for all the family. Thrigby Wildlife Park, 6 miles, offers all ages the chance to see exotic animals up close, including a tree walk where you can look right down in to the tiger enclosure. Africa Alive, 25 miles, offers animal encounters too with an incredible meercat enclosure that is not to be missed. The medieval city of Norwich, 23 miles, offers a stunning Norman castle to explore along with numerous museums, cinemas, theatre, excellent shopping, two indoor shopping malls and plenty of restaurants, cafés and pubs. Further afield is the Royal Sandringham Estate and museum, 66 miles, and Suffolk with its heritage coastline. Plenty of good cycle routes are available from the doorstep and daily fishing is available at Martham Fishing Pits. The beach is ¾ mile from Gables Farm near Great Yarmouth. With the shop 100 yards, and the pub & restaurant are 200 yards from Gables Farm. Dining room: With wood burner, Freeview TV and tiled floor. Kitchen: With breakfast area, electric range, microwave, fridge/freezer, dishwasher, Freeview TV and tiled floor. Bedroom 3: With double bed, single bed and en-suite with shower cubicle and toilet (Jack and Jill shared with bedroom 5). Bedroom 5: With single bed and en-suite with shower cubicle and toilet (Jack and Jill shared with bedroom 3). Oil central heating, electricity, bed linen, towels, Wi-Fi and logs for wood burners included. Travel cot, highchair and stairgate. Welcome pack. Small enclosed courtyard with sitting-out area and garden furniture. Hot tub for 6 (private). Private parking for 5 cars. No smoking. Holidays at Gables Farm run from Friday to Friday. Pets allowed at Gables Farm. For a better idea of where Gables Farm is, you can see Gables Farm on the map below. Gables Farm is in Norfolk; should you be on the lookout for a special offer, you can find all the special offers in Norfolk. It's always worth checking to see what is on offer at the moment. Do you want to holiday near Gables Farm (UKC2916), you can see other cottages within 25 miles of Gables Farm; have a look to find your perfect holiday location.